If you’re in the market for open plan office furniture, one of the first and most important decisions you’ll have to make is the level of privacy you’d like in your workplace. For many organizations, the work process has become much more interactive and collaborative during the last decade or so. This has translated into more low-wall cubicles and even benching systems in the workplace. Many industry experts believe the taller wall cubicles or “Dilbert cubes” will soon become a thing of the past. A staple in Europe for years, benching systems have taken a while to gain traction in the U.S. Because 65 % of the cost of a cubicle is the panel, the benching system is a much less expensive way to provide a workspace. For larger offices, the absence of panels will also allow you to cram more people into one area (higher density). Wide open, high density workplaces can foster creativity and collaboration. That can be both good and bad for productivity as well as the work environment. 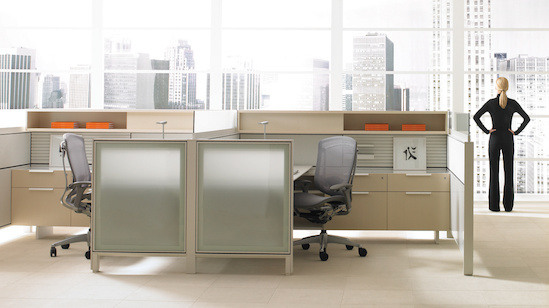 Cubicles with low walls allow employees to see and talk to each other while seated or standing. While they don’t afford much privacy, they do allow for a lot of collaboration and free flow of ideas. A company that goes the low-walled route likely fosters team work and creativity. 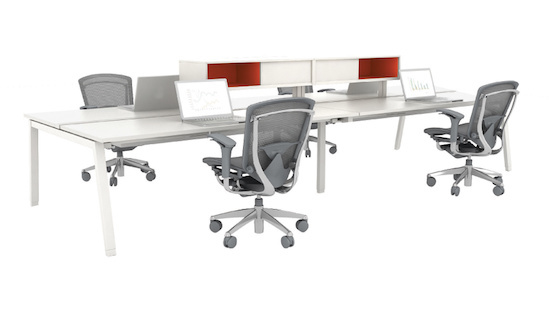 The low-wall cubicle offers about as much acoustical and visual privacy as the benching system. They do offer two benefits most benching systems do not. 1. The capacity to carry voice/data cabling and power (note the outlets in the bottom of the panels). 2. 42” high panels also provide users with a “sense of space”. While benching systems are, well, basically just a workbench, cubicles with 42” high panels at least make end users “feel” like they have their own space. That feeling may be more of a benefit than you think. Picking medium height cubicle walls is the Great Compromise of the office plan. Employees have more privacy — and by extension will have an easier time blocking out the office din to focus on work. On the flipside, all they have to do is stand to share a victory high five after landing a big client, or chat with their neighbor. While 53” high walls offer slightly better acoustical privacy, they do offer much greater visual privacy. They also provide an opportunity to hang open shelving (not bins) and other work tools. Panels 65” tall and greater offer the most acoustical and visual privacy. Even standing, employees can’t peer into each other’s office space, which allows for quiet, focused work without outside distractions. This is ideal for counselors or others who might need to have sensitive conversations on a regular basis and for people who have difficulty focusing in noisier office environments. The benefits also include the maximum capacity for cable storage and distribution and can accommodate both full-height hanging shelves and overhead bins. The drawback to high-walled cubicles is that they could make an employee feel isolated and out of touch with their co-workers, managers and the organization as a whole. Taller wall cubicles create a more formal workplace than benching or lower wall systems and may be ideal for conservative organizations that value productivity and discretion more than collaboration and teamwork. For workplaces that want some collaboration and teamwork, but would also like some degree of privacy as well as the option of overhead bins, a blended solution might bring you the best of both worlds. Blended solutions can include 42”, 53” and 65” high walls- all in the same workstation. While the blended solution is a popular choice, some facility managers might tell you it’s a nightmare to manage all those different panel heights. During reconfigurations, you never seem to have all the panels you need. If you’re addressing privacy issues but don’t want to buy new cubicles, panel extenders may be a great solution for you. They come in 12”, 18” and 24” heights and a variety of widths. The best feature is they can attach quickly and easily to any brand panel. This not only eliminates the need to buy new furniture, it also dramatically reduces labor costs during reconfigurations. Panel extenders are also visually attractive and may offer a much needed “face lift” to your old walls. There are few, if any drawbacks to panel extenders. If you put them in and decide you no longer need them, they can be removed with a single tool in a matter of minutes. While technically not an open plan system, demountable floor-to-ceiling walls are similar in most ways to cubicle systems, except they are full height. Most full height wall systems allow you to attach modular furniture components as well as run power and cabling. They also offer visually attractive surface options such as glass, laminate and wood veneer. About the only drawback to demountable floor-to-ceiling walls is the price. They typically run about 3 times the average price of standard dry wall. However, these walls are also classified by the IRS as furniture and can be depreciated much faster than dry wall. 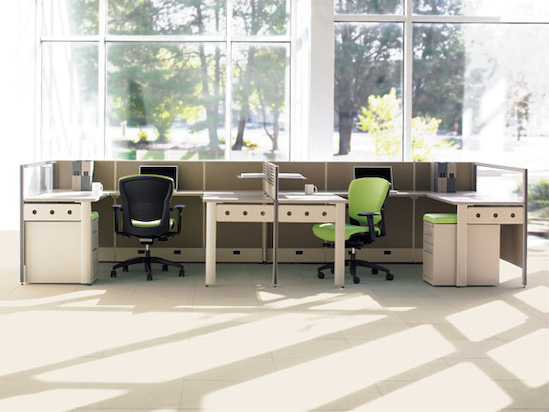 They can also be moved and reconfigured as your workplace changes. For organizations with high churn rates, moveable walls may have a lower cost of ownership than dry wall. Many of the most dynamic organizations around the world invest in demountable floor-to-ceiling walls to help them satisfy demanding privacy needs and provide the visual impact they want in their workplace. While no one can predict what the future may bring for your workplace, seeing and understanding all the options will allow you to make the most informed decision possible. Contact your Team Office workplace consultant for more information regarding wall heights or any other issue affecting your workplace. The American College of Occupational and Environmental Medicine (ACOEM) contends that workplace depression is a “common, chronic and often recurring disorder” with a substantial impact on all facets of employee and organizational performance. In order to properly rehabilitate workers who are suffering from depression, it is critical for employers to understand the illness – and to seek help from qualified mental health professionals. Because only some patients struggling with depression will be able to correctly identify and seek treatment for the disease on their own, many cases will develop unnoticed. Astute observation and intervention from fellow employees, psychologists and workplace personnel are thus critical factors in the timely diagnosis, treatment and rehabilitation of depressed persons. Depression is one of the most expensive health problems in the workplace, and especially in today’s economy it is essential that measures be set in place to defray the costs of on-the-job mental illness for the benefit of employees and organizations alike.